A classic example of racehorse syndication at its best was epitomised by the victory of Heartache for trainer Clive Cox over five furlongs. The two-year-old Kyllachy filly, who was ridden by Adam Kirby, is owned and was bred by the Harper family at their Whitsbury Manor Stud in Hampshire, but leased to The Hot To Trot Syndicate, which was set up by Sam Hoskins and Luke Lillingston. The current roster involves seven horses, all two-year-olds, and with 75 members who all paid a one-off fee of £2,000 to gain shares in the septet. Hot To Trot has the option of leasing Heartache for two seasons - and will certainly take up the option of keeping her next season - and she will then go back to Whitsbury for a mating with its star stallion, Showcasing. Another filly, the Ed Walker-trained Exrating, who has yet to run, will follow the same path assuming she makes a mark this year as a juvenile. Heartache, 5/1, beat the 10/11 favourite Happy Like A Fool from Wesley Ward's stable by two and a half lengths, with Out Of The Flames, 14/1, half a length back in third. Cox said: "She's very special - she did it very well at Bath [on her racing debut], and I couldn't believe the time of that race. She's no different from the rest of mine in that she has improved for a bit of racing and she's lovely to deal with. "Her mother (Place In My Heart) was very quick - we won a Listed race with her at Bath - and today's run was awesome. To share it with this wonderful Hot To Trot Syndicate is great - there are all manner of people here today who are so buoyed by the experience. "We knew she was nice, but we were not sure how nice - to win at this level is what it is all about. I was a bit worried when I saw the American filly [Happy Like A Fool], who looked pretty special in the paddock, and when Adam took her on as early as he did I was a bit concerned. Adam rode her with complete confidence, and is a pretty good fellow in the saddle. "Two-year-olds are my passion, the stars of the future, and she is." Heartache was given 12/1 quotes for the Nunthorpe Stakes, but Cox said: "Let's just enjoy the day, we have a lot of decisions to make." Hoskins said: "Luke and myself set up this syndicate six years ago to try and get more people involved with racing. "We have had lots of winners but this is the filly we have been looking for, and thank you hugely to Whitsbury Manor Stud for leasing us this amazing horse. Also a thank you to our amazing members - we have got 75 and I think most of them managed to get in here!" Lillingston added: "We lease all our horses from breeders which means this is very, very affordable. Everybody who is here today, it has cost them a couple of thousand to have seven horses in training. This is one of the best days of my life." The strongly supported 10/11 favourite Happy Like A Fool, trained by Wesley Ward in America, had to settle for second. The leader under Ryan Moore, the two-year-old daughter of Distorted Humour showed a nice turn of foot inside the two furlong pole but was unable to match the finishing kick of the winner, who scored decisively by two and a half-lengths under Adam Kirby. Richard Hannon's Out Of The Flames, stayed on well in the closing stages to finish a further half-length behind in third. American handler Ward, who tasted victory at the Royal Meeting yesterday with G1 King's Stand Stakes winner Lady Aurelia, was downbeat but proud of his filly's performance. He said: "When Ryan [Moore, jockey] came back in, he just said that we got beat by a better filly and I kind of agree with him. "She broke well and was there throughout like all mine have been in the past, but the other filly [Heartache] was just a little bit more talented than our filly today. "Hopefully, we can turn the tables in the future. "All these horses are young two-year-olds even though mine are more forward. With that in mind, I do think that this filly is a big filly and I feel that she will mature into something special in the future. "We will see what happens in the future but I'm happy right now." A tilt at the Qatar Goodwood Festival is on the horizon for the US-bred filly, with Ward adding: "She will go to the Molecomb (G3, 5f) at Goodwood (August 2) and that should really put her forward for the race." Out Of The Flames took a big step in class from her last run in a class four at Windsor, where she was an eye-catching winner, to finish third in the Group Two Queen Mary Stakes over five furlongs on the second day of Royal Ascot. The Showcasing filly, owned by Qatar Racing, is trained by Richard Hannon who commented: "We are delighted that there is a very big run in this filly one day. We might look at the Prix Robert Papin or similar races. "She is a very sensible filly who looks after herself. She will last." 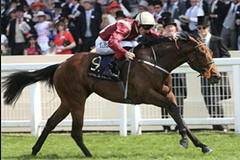 Oisin Murphy who rode the three-length third added: "It was a very good run. It was a massive step up on Windsor and Kieran O'Neill who rides her everyday said she was going to run a race today. So fair play to him."